DENVER — A diverse crowd of almost 3,000 people gathered at Temple Emanuel Sunday night to honor the 11 victims killed in a mass shooting at Pittsburgh’s Tree of Life Synagogue. Rabbi Jay Strear, the president and CEO of Jewish Colorado, said the act of terror in Pennsylvania was designed to “make us stay in our homes,” and to be afraid to walk to synagogue on Saturday mornings. Before the vigil began, Strear told Denver7 that the violence was a statement of what one individual believes America should be, but, specifically, is not. Strear introduced Scott Levin, the executive director Anti-Defamation League Mountain States. “I’ve been to too many vigils,” Levin said. He said he has attended them as an ally for the LGBTQ community, immigrants, refugees, women and the teenagers who were shot in Parkland, Florida. “I didn’t think that I’d have to ask the community to come to Denver to stand with my community — the Jewish community” he said. Levin noted a historic parallel between what is happening now, with the rise of anti-semitism, and what happened just prior to WWII. He said Kristallnacht opened the floodgates to the Holocaust. He said he was pleased with the difference he saw at Temple Emanuel Sunday night. That statement drew a thunderous round of applause. Denver Mayor Michael Hancock attended the vigil Sunday evening. "We cannot let this attack on a congregation in Pittsburgh be just another historic tragedy," he said. He added that the response must be a demand for tolerance, compassion, equity and accountability. Colorado Gov. John Hickenlooper said antisemitism and other forms of discrimination debase our culture and degrade our values. Rev. Amanda Henderson of the Interfaith Alliance of Colorado said we are seeing hatred arise and that disease is killing us. Over the past few days, she said she’s been asked several times over how to change this ongoing pattern of hate. “We must support leaders who inspire us and unite us, not tear us apart," she said. 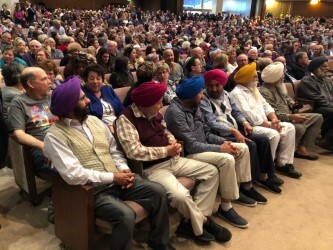 “No American wakes up on Sunday, goes to their place of worship and expects to be shot and killed," said Dilpreet Jammu of Colorado Sikhs. He said he first spoke those words in August of 2012, when a white supremacist terrorist walked into a Sikh gurdwara (temple) in Oak Creek, Wisconsin and killed six members of the Sikh community. Jammu said he couldn’t imagine back then that he’d soon be hearing about shootings at a church in Charleston, South Carolina and then a synagogue in Pittsburgh. “Our hearts are filled and are broken at the same time," said Qusair Mohamedbhaiv of the Colorado Muslim Society. He said the Anti-Defamation League was present when members of a mosque were killed. He quoted a letter signed by 21 Muslim organizations that represent 75,000 Muslims in Colorado. Mohamedbhai said the Jewish community is being targeted, in part, because it has helped Muslim refugees come to the U.S. The ceremony ended with a reading of the names of the 11 victims killed in the Tree of Life shooting, and the lighting of a candle for each one, followed by the singing of a ritual prayer. Strear said those who want to help the families of the victims killed in Pittsburgh can do so via a link on Jewish Colorado’s homepage .